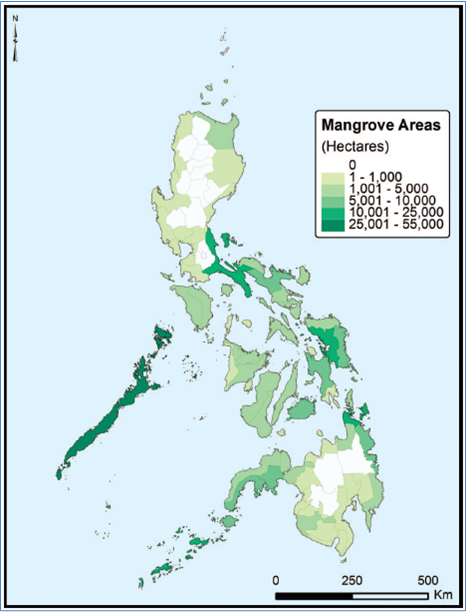 The largest remaining mangrove areas are located in Palawan and Quezon in Luzon, Samar provinces in the Visayas, and Zamboanga del Sur, Zamboanga Sibugay, Surigao del Norte and Sulu provinces in Mindanao (Long and Giri, 2011). 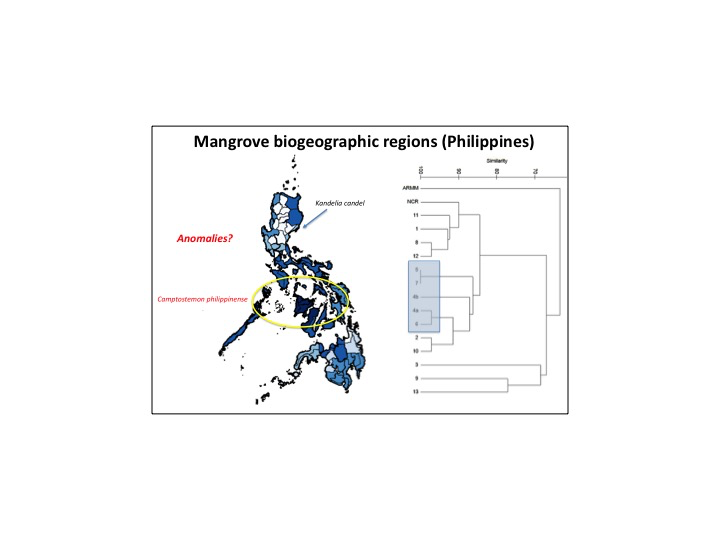 The Philippines has high mangrove diversity (35-40 species) and may have been a recipient of active species exchanges within the Indo-Malay Philippines Archipelago (IMPA) pathways. High species richness (> 30 species) can be found in northern Philippine Sea and the Visayan Seas. Most of these species can be found in the entire archipelago, although, some species have a more restricted distribution. These species have restricted and oftentimes disjunct distribution. High species richness (≥ 30 species) are in regions 2, 4a, 5, 6, 7 and 10 (referred to as the northern Philippine sea and the Visayan Seas). Lowest species richness can be observed in Regions 13 and ARMM with < 20 species (Sulu Sea). The center of mangrove biodiversity in the Philippines is in Regions 4, 5 6 and 7 (southern Luzon to central Philippines), then tend to decline as it moves northward and southward. There seems to be west-to-east pattern as well (Fortes and Salmo, 2015). Species that are commonly found in the entire country (> 90% occurrence out of 15 regions) are Aegiceras corniculatum, Avicennia marina, Bruguiera gymnorrhiza, Ceriops tagal, Excoecaria agallocha, Lumnitzera littorea, Lumnitzera racemosa, Nypa fruticans, Rhizophora apiculata, Rhizophora mucronata, Rhizophora stylosa, Scyphiphora hydrophyllacea, Sonneratia alba, Sonneratia caseolaris and Xylocarpus granatum. Of these, seven species are present in all regions, namely: Avicennia marina, Lumnitzera racemosa, Nypa fruticans, Rhizophora apiculata, Rhizophora mucronata, Sonneratia alba and Xylocarpus granatum. Species with < 50% occurrences across regions are: Acanthus volubilis, Acrostichum speciosum, Avicennia lanata, Bruguiera parviflora, Camptostemon philippinense, Kandelia candel, Pemphis acidula and Sonneratia ovata.